Recently I had the good fortune to discover the work of another artist/photographer whom I had not encountered before. His name is Gus Petro and he lives in Zurich, Switzerland. Gus recently made a tour of the US which included stops in New York and the Grand Canyon. He was struck by the grandeur and scale of both, and decided to use his creative skills, as an artist/photographer, to create a new vision of the New York panorama within another great panorama, the Grand Canyon! As a result, Gus is having a showing of his work, entitled “Merge”, featuring his images of familiar New York skyline views, seen as if the city had been transplanted into one our great natural wonders. More specifically, the urban environment as seen in one of nature’s great backdrops, the Grand Canyon. In Gus, I found a kindred spirit, and it has motivated me to write this short commentary about my own feelings and how I once chose to express them. In 2001, on Tuesday morning, September 11, many of us remember the tragedy which greeted us as we switched on radios and TVs on that fateful morning. I won’t forget the image of one of the twin towers burning and the image of the second plane swinging toward the second tower. As FDR once said, it was “a day that would live in infamy” (referring to the bombing of Pear Harbor), and much of what has happened since is related to this singular recent event on that one tragic day. I too, have been a frequent visitor to New York and to the Grand Canyon. Shortly after that earth-shaking event in New York and its aftermath, I felt the need to send a message to reassure us that this was uniquely our country, one of the greatest on earth, and that it stood for something extremely important, and which had changed the lives of millions of people for the better – the chance to come to a place where liberty and freedom were reality, and to a country which had always fearlessly defended that heritage for all generations which would follow. It is a proud heritage and I wanted to produce a visual statement which would express what was in my heart. My mind turned to two important icons from my past experiences. The first is the proud icon which still stands as a beacon to all who encounter her, often on their first trip to America, as they enter the gateway to a new life in freedom. The Statue of Liberty stands proudly in New York Bay, on Liberty Island, as a symbol of pride and a metaphor – a gift and a tribute to the country for which she stands so proud. The second was the awe-inspiring spectacle of the Grand Canyon which nature herself created in this land we call our home. It too is known round the world for its magnificence, its grandeur, and it symbolism of the great country of which it is a part. It seems to speak to the greatness and to attest to the uniqueness or our homeland that we call America, a place like none other on this earth. In my mind, the joining of these two great icons would remind people of first, the magnificence of this land, and second, the principles and promises for which it stands. 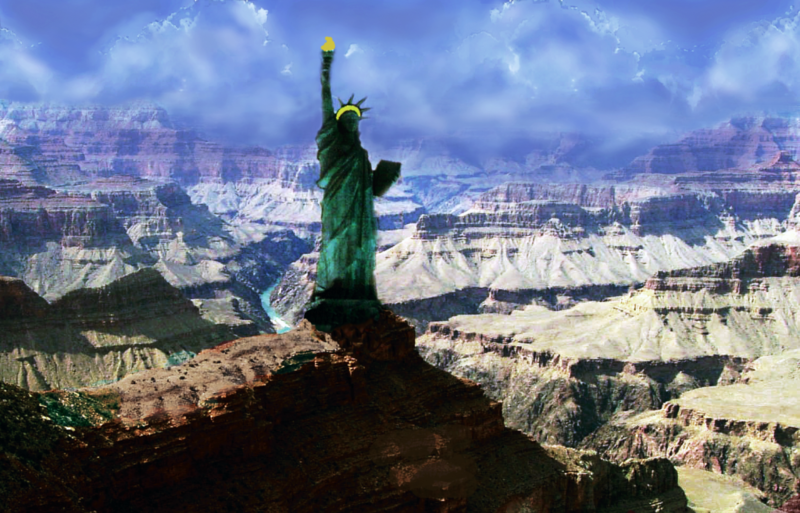 I imagined the power of an image of the Statue of Liberty standing high and proud above the Grand Canyon. I had envisioned what I wanted to say and how I would say it. Visitors to my website (justice-arts.com) are familiar with this image which appears in my photo-art gallery. It will also be an addition to my newly created shops (accessed from the website) for purchase as a print, T-shirt, or other, to convey its message to all who would see it or proudly display it. If you haven’t seen my visual tribute, which I have always referred to as “Lest We Forget” (inspired by the events of 9-11). I will proudly include it here for all to see and perhaps to be reminded of who we really are. Yes, she is threatened by the storm clouds on the horizon, but rest assured that, as always before, she, and all that she stands for, will survive the storms and continue to shine her light proudly to the world, attesting to the greatness of the people, their heritage, and the great country which she represents. May her torch continue to shine brightly to all the world, now and forever. In Gus Petro I found a kindred spirit. Both of us were moved to make a similar statement, but for different, and yet, perhaps the same, reasons. Gus, I thank you for bringing these thoughts back to me and for sharing your images with us. I am proud to share this image with all of you. Take pride in your country, defend her honor, and preserve her heritage for all who will follow, and may God bless America.